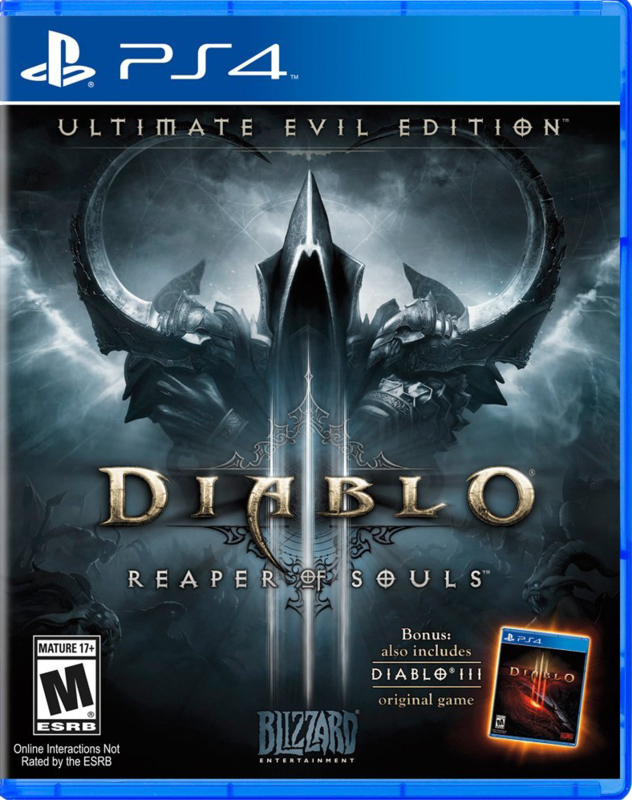 Amazon has notified the Diablo III: Ultimate Evil Edition is now available for pre-order for the following consoles: PS4 | Xbox One | Xbox 360 | PS3 . The game is slated to ship on August 19, 2014. Pre-order and receive an exclusive Infernal Pauldrons in-game item. 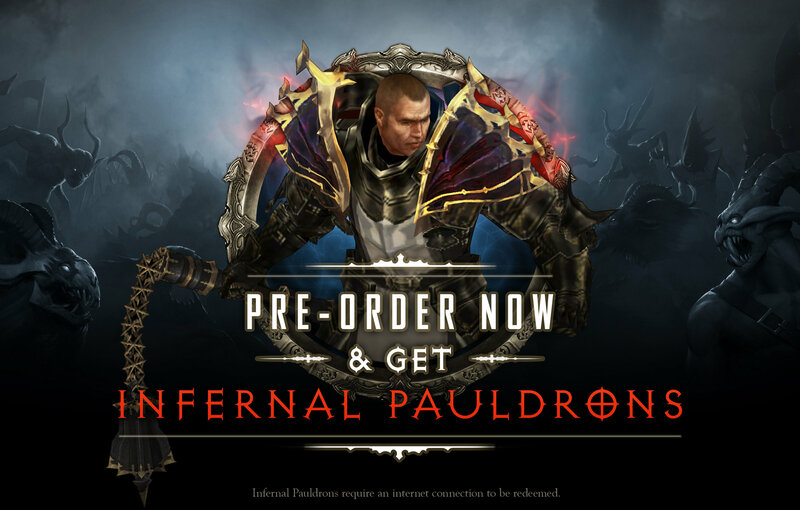 The Infernal Paudlrons are wearable at level 1, and provide bonuses to Vitality, Life per Second, and Cooldown Reduction, and are primed and ready for transmogrification. The key for the Infernal Pauldrons can be found in your pre-ordered copy of Diablo III: Ultimate Evil Edition. Requires an Internet connection to be redeemed and cannot be transferred across platforms. In addition, Degin by Humans launched a giveaway. 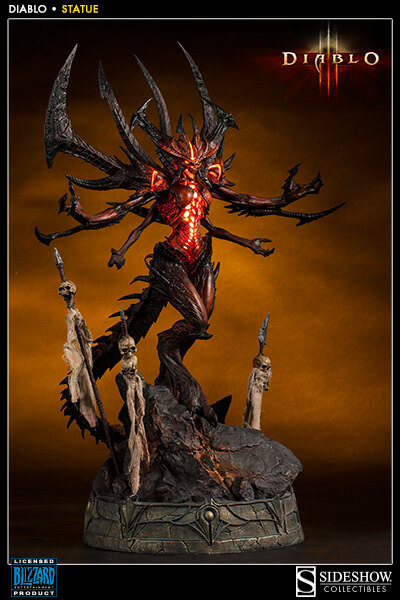 The top price is a Diablo III: Reaper of Souls Collector’s Edition, second prize a Diablo III Tyrael mini-statue. All three top prizes include your choice of any of the Design by Humans T-shirts. The month of May not only means J!NX’s 15th birthday, but also Diablo III’s 2nd birthday! 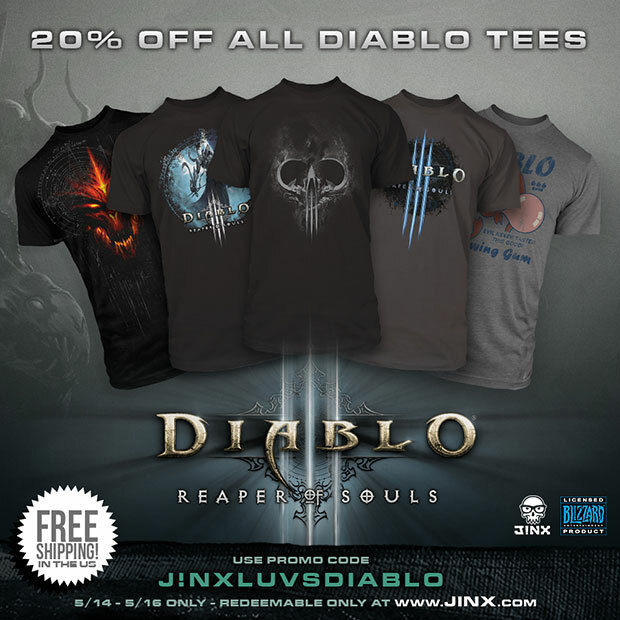 In conjunction with Blizzard Entertainment, J!NX is offering 20% off all Diablo tees from 5/14 to 5/16 when you use promo code J!NXLUVSDIABLO during checkout. We’re also throwing in free US economy shipping on all orders containing a Diablo tee! To many more years of terror! I got an alert from Amazon announcing the Xbox One Console – Standard Edition without Kinect is now available for pre-order. 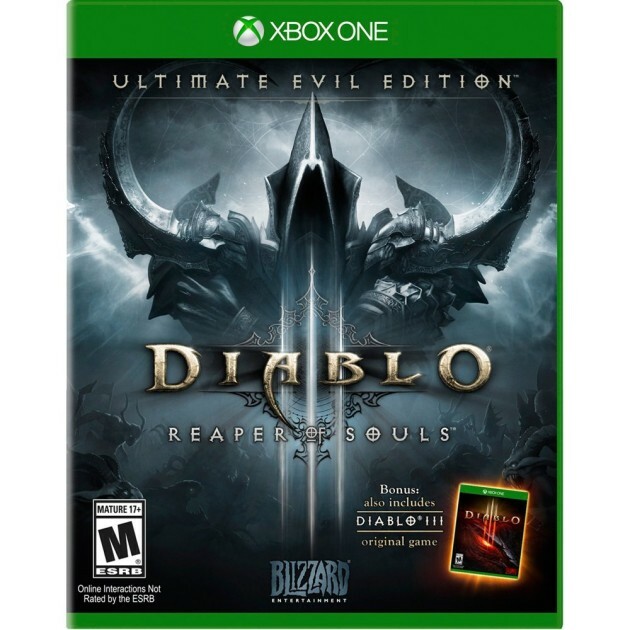 Those who wish to upgrade to the new console to play Diablo III Ultimate Evil Edition may expect XBox One to ship on June 9, 2014. Grab your XBox One while supplies last. Don’t forget to pre-order the Diablo III: Ultimate Evil Edition – Xbox One which ships on August 19, 2014. **I recommend to pre-order each item separately so that each ship on their release date. NECA is shipping one to me directly for a review. I’ll provide photos and video to show you the sword in detail and its dimensions. 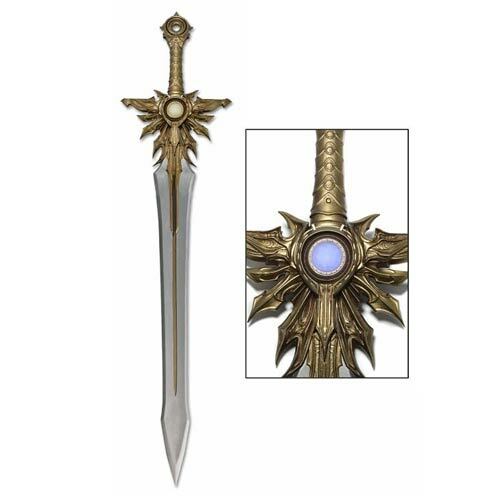 Go order Diablo III – El’Druin – The Sword of Justice Prop Replica while supplies last, and wield El’Druin proudly to accompany you on your quest for Justice. Only the righteous can wield this superb prop replica from Blizzard Entertainment’s Diablo III — El’Druin, the Sword of Justice! This recreation of Archangel Tyrael’s legendary weapon was built directly from digital files used in-game, and measures nearly three and a half feet long. It features a pulsing blue LED light in the hilt, simulating the awesome protective powers the sword draws from the High Heavens. Each El’Druin is carefully crafted of ABS, plastic and PVC in a construction designed for durability and impact resistance. Afterwards, it is hand-painted in gold and silver, using a mix of washes and dry brushing to enhance the detail and the metallic feel. The result is a realistic replica that looks just like the real thing, but is perfectly safe. Batteries included. Back on October 12, 2013, at the New York Comic Con — Micky Neilson told me there were plans for a novella based on Morbed. 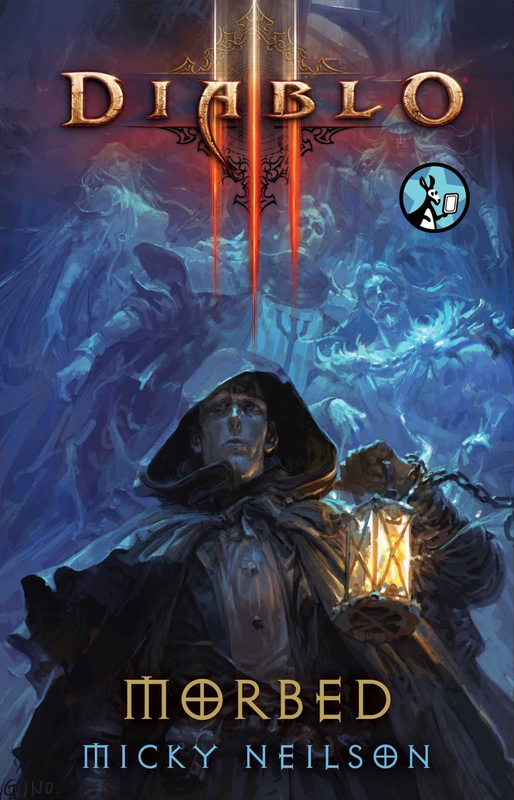 Today Pocket Star released the new digital book Diablo III: Morbed by Micky Neilson (Blizzard publishing lead & New York Times best selling author). This character was first revealed within the pages of Diablo III: Book of Tyrael , foreshadowing things to come. Details of this digital book were kept in shadows until barely four days ago when I stumbled upon it at Amazon. 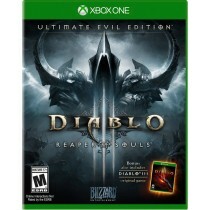 I check Amazon.com nigh daily in search of upcoming Blizzard books, and Diablo III: Morbed wasn’t in Amazon days ago. The digital book is now available today and can be read. I started reading it sometime around midnight. What is Morbed, and where is it based on in the timeline? The story seems to happen a few months before the events of Diablo III: Reaper of Souls. The King of Westmarch was still alive, and it had not been invaded yet by Malthael’s forces. Here are a few details to share. Morbed was a former thief. A band of adventurers defeated the King of bandits in Aranoch; and word quickly spread about their feat and reached the ears of Justinian the king of Westmarch. Justinian summoned this band of adventurers to find a hooded vagabond who was seen entering some of the ruins hidden beneath the Bloodmarch. It’s said this vagabond collected relics from the catacombs and possibly pillaging the Tomb of Rakkis. The band is composed of Morbed, Jaharra (wizard), Aedus (druid), Clovis (crusader), and Vorik (necromancer). Clovis the crusader was in this mission because he wished to find the bones of Akarat to renew the faith of his religious order. The crusader thought this mission would help his quest. Now what most catches my attention about this story is the inclusion of, both, a druid and a necromancer to a story that took place sometime before Reaper of Souls. At one point, Jay Wilson said to MTV Multiplayer some of the previous classes might return in future Diablo III expansions. We have seen a necromancer NPC in Diablo III already, and most recently Zayl the Necromancer was among the five heroes recruited by mortal Tyrael to steal the Black Soulstone from the High Heavens (as seen in Diablo III: Storm of Light ); but we had not heard of a druid in a very long time in-game or in the printed media based on Diablo. Like in comic books, some characters are heroes — like Superman (DC Comics), Captain America (Marvel Comics) — while others are anti-Heroes with traits of heroism such as Wolverine, Ghost Rider, Daredevil, even Batman. They are not 100% noble or moral. They have shades of grey. Willing to kill, or to follow their own personal agendas. I think this is the first time I see a Diablo character such as Morbed. The only other Blizzard character I can compare him with is Prince Arthas (at Stratholme and Dragonblight). Prince Arthas and even Kael’Thas were formerly noble, and righteous in their own way. Then their lives changed drastically. Dramatically. The scars were deep. Their emotions a maelstrom. Eventually, their morals shifted, and they turned to evil. Morbed comes from a different background. He was a former thief. He is changed his old ways, but other non-heroic traits have stuck around. The way he is pictured in this story he is going from a scumbag to someone seeking redemption for his past deeds. That gives Morbed some depth as a character. As well as bringing up controversy. Why should we care about the character? Well, look at how Wolverine has boomed the Marvel Comics and films. It has been proven that Anti-Heroes, well written, are a formula that do work. Especially, if you as an author craft a good complex story with twists and drama. The reader becomes entangled into the story, and starts to care about the anti-hero, and wishes to learn more. The reader gets hooked to the anti-hero. I have no doubt Morbed eventually becomes a hero, but in the first half of this story, Morbed is anything but a hero. He is selfish, he betrays, he won’t risk his life for his own band; and above all else… he is a survivor. He knows his way out of trouble. He uses all the abilities he learned as a former thief. He is no hero. The problem with Morbed is that he won’t risk his hide to help his own teammates in the battlefield. He is willing to leave behind his platoon. Yet, he is filled with guilt. That element on its own can be exploited by the author. There is a potential way lingering in the air to redeem his past mistakes with this guilt element roaming his mind. The question is … what is Micky Neilson planning to do with this new anti-hero? Diablo III: Reaper of Souls launched barely a month ago, and there is no trace of this character as a new NPC. Is he slated to appear in a future content patch? Or the next expansion? That is something to ponder about. More questions inbound. Are we going to see more of Morbed in a full-fleshed novel in 2015? A graphic novel based on him? Otherwise, why write about a nobody character if you have no plans to expand? Makes no sense right? So, one must assume there are plans for this character. Those characters birthed through the Diablo III short stories came to life in Diablo III: Storm of Light , and they assisted Tyrael — a central figure in the Diablo universe. Hopefully, we will hear more from Micky Neilson on what plans he has for Morbed, when he is ready to share details. I do recommend Diablo fans to read Diablo III: Morbed . If this story is foreshadowing things to come either in printed media or in-game at some point, then it is a must-read. We not only learn about a dark anti-hero who gains strange power through this enigmatic lantern, the reader also learns about an ancient history. In Warcraft, we know the Amani Trolls lived in the region we know now as Quel’Thalas. The High Elves traveled there, decimated the trolls, and usurped their sacred lands to build Quel’Thalas. In the Diablo universe, on the other hand, we have heard for years how Rakkis fought his way into the west lands and founded the city of Westmarch. However, have we ever learned who Rakkis fought and who originally lived in what we now know as Westmarch and Bloodmarch? Indeed, Blizzard did never delved into that. Diablo III: Morbed gives us a glimpse into this when the hooded vagabond faces Morbed, and the vagabond reveals to Morbed his motives to pillage ancient artifacts from the Tomb of Rakkis and adjacent underground ruins. What if this people — exiled from the former Blooming Moors (now known as Westmarch) — became a new class in the next Diablo III expansion? That’s another one to ponder. This short story would then be the prelude to that. Would you dare not to read even out of curiosity? I will giveaway 10 copies of Diablo III: Morbed (via an Amazon Gift eCard). You must be a follower of Blizzplanetcom Twitter or Facebook. Winners will be contacted through Facebook or Twitter. Winners will be listed beneath this line of text so check back. Make sure to check out your social account inbox. Giveaway ends Wednesday, April 23 at 11:59pm EST (New York). The fisherman – a merchant, posing as a fisherman, who brought the band to the isle. The vagabond – descendant of the original inhabitants of the Blooming Moor (now known as Westmarch) who were exiled by Rakkis. 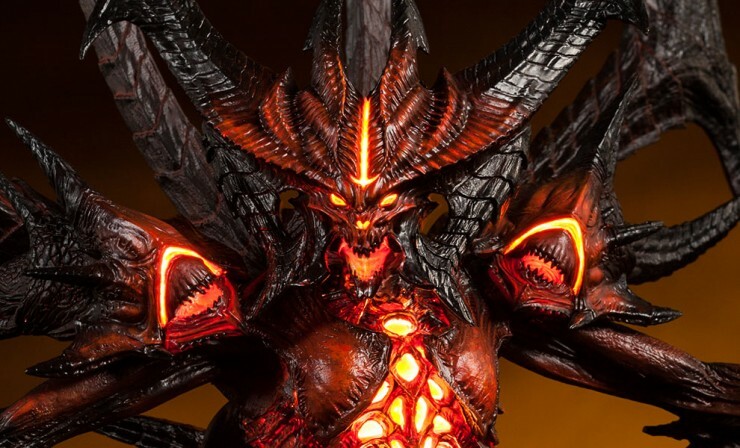 Pocket Star will publish a brand-new story based on the Diablo universe which is written by New York Times best selling author and Blizzard publishing lead Micky Neilson. I am amazed at how quick this book is coming and how it utterly bypassed my long-range radar. All the more welcome. I already pre-ordered and it will be delivered to my Kindle PC software right on my computer desktop. Feel free to download the Kindle app for PC/Mac or for your favorite mobile device before pre-ordering, to sync the app with your Amazon account. The new digital book is titled … Diablo III: Morbed . This is the same enigmatic character revealed to exist in the pages of Diablo III: Book of Tyrael . 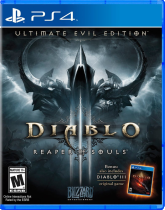 Diablo III: Morbed will be published on April 21, 2014. Contains 64 pages. A month ago, I reported that Robert B. 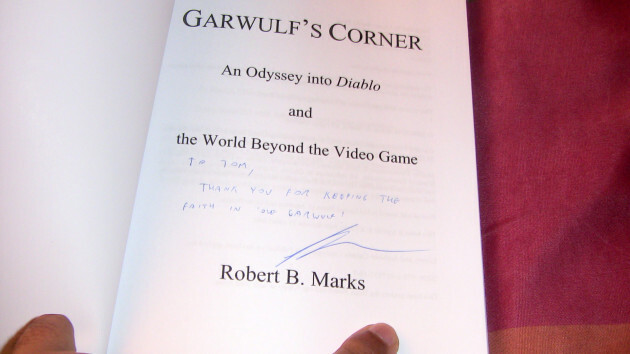 Marks plans to launch a book titled: “Garwulf’s Corner: An Odyssey into Diablo and the World Beyond the Video Game”. 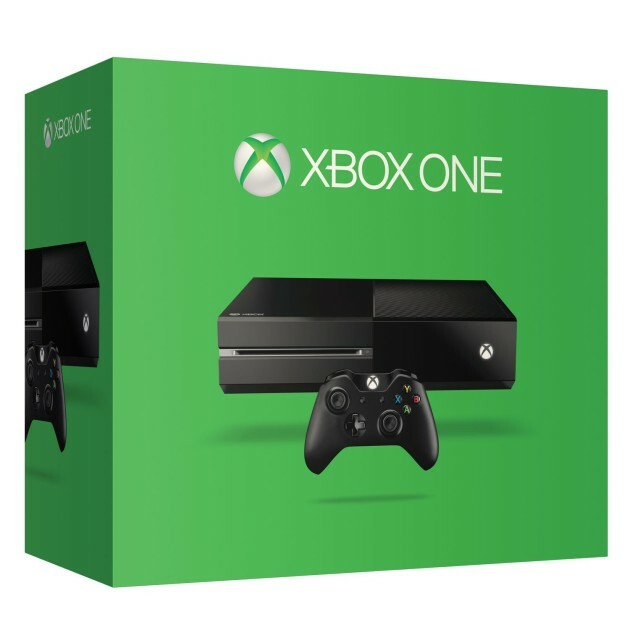 It is slated to ship on October 2014. A couple days ago, Robert shipped to me a review copy with a signed dedicatory. Any veteran Diablo fan will no doubt remember the old good days when multiplayer games began to flourish. Players were still using 56Kbps dial-up internet connection services such as AOL, and CompuServe. Early DSL was running 128 to 256 Kbps and it was expensive. Diablo had become a success, and Blizzard Entertainment launched Diablo II on June 29, 2000. It was back then when a geeky gamer and writer age 24 managed to sell his first published story. Robert B. Marks wrote probably one of the first Video Game-based eBooks for Blizzard Entertainment based on the Diablo universe …. Diablo: Demonsbane. It was published on October 2000. Pocket Books published the first Blizzard eBook in an era where eBooks were a struggling experiment. The first eBook readers from 1997-2006 were not well-received. Not until the big boom when the first Amazon Kindle device shipped on 2007. Back on 2000, Robert B. Marks also began to write a bi-weekly column titled Garwulf’s Corner for Diabloii.net (now found at diablo.incgamers.com). He wrote about Diablo II, about gaming, literature, movies, hackers, AI, and other topics. In a time where there weren’t that many fansites or gaming websites with similar discussion topics other than news, reviews or strategy guides. 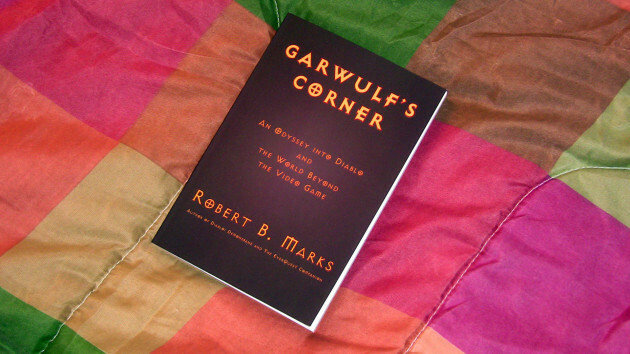 Garwulf’s Corner earned many readers over the few years it lasted. Even today, the archive can be read online. Those veteran Diablo fans can now get this piece of history in printed form. The book contains a 3-page introduction written by Robert B. Marks, all 52 articles of Garwulf’s Corner, three articles that were never published in the Blurred Edge magazine, and an article the author wrote after Diablo III was announced. 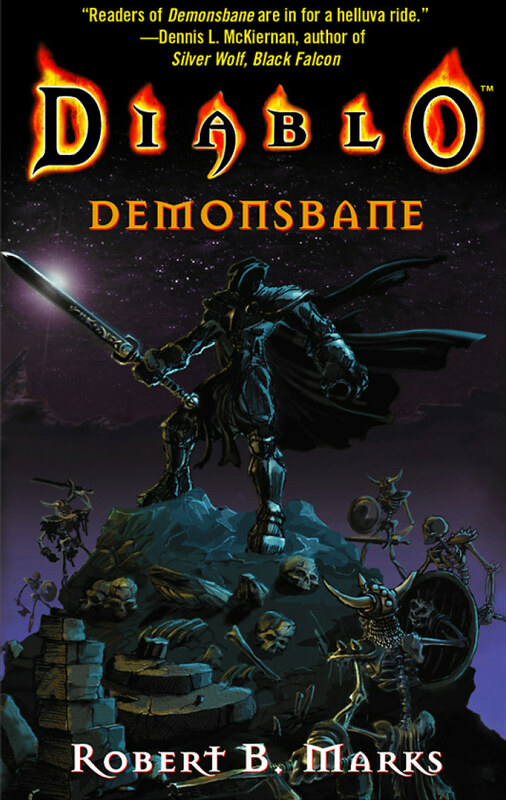 If you haven’t read Diablo: Demonsbane, I recommend to get the Diablo Archive which reprinted it in physical form. At the dawn of the 21st Century, the video game industry experienced a period of wild creativity, fighting for recogniztion as an art form while making the transformation into a media juggernaut. And as it did, Garwulf’s Corner was there. One of the earliest, if not the first, video game issues columns on the internet, Garwulf’s Corner ran every two weeks from 2000 to 2002 on Diabloii.net, Written by Robert B. Marks, author of Diablo: Demonsbane and The EverQuest Companion, it explored everything up to and including Diablo, the birth of artificial intelligence, hackers, literature and movies, and the video game’s struggle for legitimacy. Collected here for the first time in print — whith new introductions and updates — are all 52 installments of Garwulf’s Corner, along with the three columns written years later for the unpublished Blurred Edge Magazine, the holiday issue that never was, and the author’s final word (so far) on Diablo III and Diablo in general. 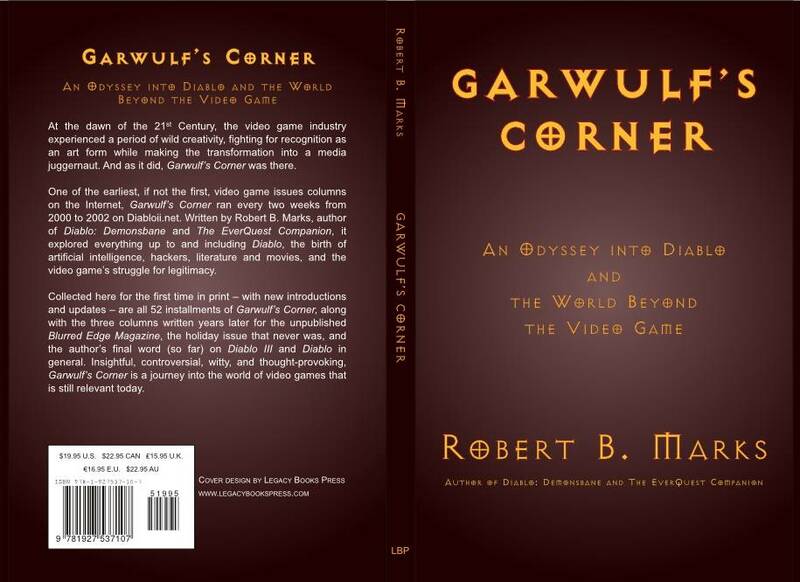 Insightful, controversial, witty, and thought-provoking, Garwulf’s Corner is a journey into the world of video games that is still relevant today. The video game’s struggle for recognition and legitimacy as an art form. How we play video games and what it means for our lives and society. The ethics and dimensions of video game hackers, DRM, and piracy. Issues such as sexism in video games, and how we should face them. Robert B. Marks is an author, writer, editor, trained historian, and publisher. He is the author of Diablo: Demonsbane, The EverQuest Companion, The Traveler on the Road of Legends, and the co-author of A Funny Thing Happened on the Way to the Agora. Since 2013 he has also worked in public relations and community outreach for Darksword Armory. In his spare time, Robert makes mead, practices German Longsword, plays Magic: The Gathering, and very rarely (and very badly) plays the violin. He lives in Kingston, Ontario, with his wife Johanna. Available on October 31, 2014 at bookstores and online.